Keeping our fingers crossed that I can get Emeli to sing the theme song to LONDON BRIDGES FALLING DOWN. Church 1 is beckoning. More in the Spring… POWERFUL, GRITTY, AUTHENTIC AND REAL… The power of a women. Could be a match made in Heaven! (Posted January 16, 2013) I have known about Emeli for a very long time because of her work with Tinie and everything going on with my own interaction at Parlophone. Emeli Sande is an electrifying organic talent/live performer/songwriter that is poised to become the biggest singer in the world. Two years ago I told Adele that she would sweep the Grammys. This week I told Emeli she would sweep the Brits. Emeli and Adele prove that real talent can rule everything else. No dancers…. no lip-synching …..no photoshop…. just a microphone a spotlight, real songs, real musicians, and burning onstage. I would like to Thank Emeli, Adrian, and Alex for their hospitality this past week. 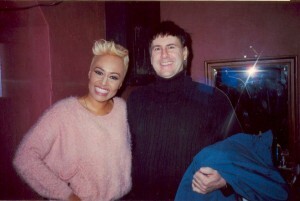 Emeli’s smile lights up the whole room and she’s such a warm person….which is part of why she is well on her way to a decades long career. The photo was taken after I crashed hair and makeup the other night and told Emeli I would see her at the Brits after-party and had her laughing about distracting Kylie’s boyfriend for me.